On a day that witnessed the presentation of the country’s annual budget in Parliament, Foreign Secretary Nirupama Rao pitched for the pursuit of a robust economic diplomacy that would be in tune with India’s stature as “an important bulwark of the global economy”. “Our diplomats must work to catalyse growth”, said Ms. Rao, “and as it is often said, the business of today’s diplomacy is business itself”. 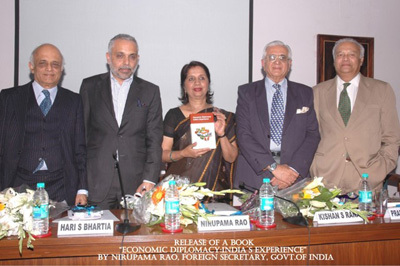 She was speaking at the Indian Council of World Affairs on the occasion of the book launch of “Economic Diplomacy: India’s Experience”, edited by Ambassador Kishan S. Rana and Bipul Chatterjee. The Foreign Secretary observed that increased expectations from India meant that a “constant reinvention of our role” in global economic affairs was imperative. Ms. Rao highlighted three areas of priority, namely the protection of India’s interests at the WTO, addressing the country’s energy security concerns and ensuring increased market access for Indian goods abroad. However, the surge in economic diplomacy should also correspond to our national and political interests, she said. Overseas investments “must respond to local sensitivities” regarding “employment and environmental aspects”. Economic diplomacy also meant looking inward, according to the country’s top diplomat, who added that the recent slackening of Foreign Direct Investment into India was a consequence of procedural delays, issues of land acquisition and concerns regarding quality of infrastructure. Appreciating the efforts of entrepreneurs and India’s diaspora among others in increasing the country’s share of global trade, Ms. Rao observed that diplomats and commercial machinery were collaborating more closely than ever. Earlier, the president of the Confederation of Indian Industries, Hari Bhartia, had acknowledged a “deeper engagement with Indian embassies on support regarding local regulatory environments”. The increasing visibility of business delegations in high-level visits of state dignitaries, Mr. Bhartia said, was also an encouraging sign.